STOP! I’m going to Bite You; Never Mind…I will go Get Help! Have you ever met this dog? 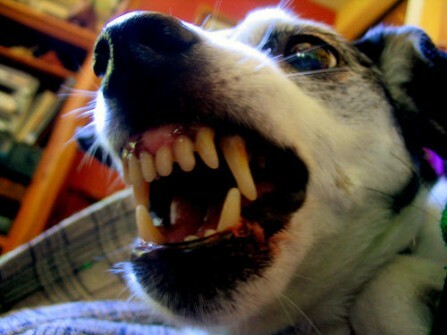 This is the dog that threatens to decapitate you when you go to someone’s house, but when you are in the house he is not sure whether he should rush you and bite you, bite your ankles, or run away. Most dogs need a little help with their doggy door manners but I feel particularly bad for this kind of dog. And, I feel particularly bad for the people that visit this dog’s house! I have a new client. He is an 8 month old Shar-pei mix rescue puppy and this is one of the many problems he has in his life. He rushes the door, teeth bared; hackles raised and threatens to rip my head off when I come to his house. When I come through the door, however, he is unsure that he wants to challenge me so he rushes forward and barks then flies backwards and tries to get away from me and the situation. I feel sorry for him. I feel sorry for his new family. And, I feel sorry for ME and anyone else who makes the mistake of coming to visit. No one wants to feel like they are going to have their eyeballs plucked out, or ankles bitten. And, I know he doesn’t like feeling this way but he simply doesn’t have the social skills to deal with this kind of stress in his environment. He has all these instincts that tell him to protect his new home and family. And, because he hasn’t been socialized properly, he is not convinced that he wants to meet new people, or that they have anything to offer him. So he throws a stinky fit, and barks and growls and threatens people to keep them out of his space. When people enter his home his confidence is tested and he is pushed to the brink. He wants to continue to threaten to hurt people, but he is afraid to get too close so he runs backwards and tries to get away and out of the situation. The Biggest Problem, you Ask? Aggression is Aggression and can End Poorly for Everyone! The biggest problem is the sense of confidence the owner of the dog has; because the dog is backing up. He thinks his dog is not being aggressive or will not bite because the dog eventually backs up and concedes space. However, this is the dog I fear the most as a trainer. The dog that blatantly wants to rip my head off and spit down my neck is pretty easily spotted by me and his owner. He doesn’t back down or allow people into his home without a leash or restraint. But, people think if a dog is slightly fearful, he won’t ever make contact with people coming over. While this is true for me and probably other very dominant people; someday someone who is smaller (children), older (the elderly) or just apprehensive about dogs suddenly becomes someone the dog can dominate and bite. As his confidence grows in his new environment, he is more likely to bite… and then run! And, then possibly just bite. If you have a dog like this, he is conflicted. He feels a need to protect you, but he doesn’t want to have to get close enough to the new person/persons to do it. He needs for you to take the stress out of the situation by telling him that you are in control! Although he tries, he really doesn’t want to be in control! He would much prefer that you step up and tell him to stop and then give him something else to do! He feels like someone needs to be in control and if you won’t, he has to step up and into a position he is not comfortable being in! Put him on a leash prior to people coming over. If someone shows up unannounced, keep a leash by the door and possibly put a sign on the door that says “Dog in Training, Please Give us a Moment to Put him on a Leash”. Trust me, people will appreciate the fact that you are taking control and will not be allowing the dog to bite them. Work on obedience in the house prior to company coming over, so you can use it when you have company. I have my dogs do down stays at my feet when people visit. If they listen to me, they are rewarded with really good treats (like chicken or cheese) and then I also have people toss treats at their feet. This way, company is exciting but not too exciting and they are getting the BEST treats from me for listening to my commands. 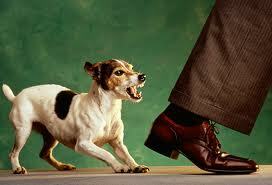 By putting your dog on a leash and giving him obedience commands to do, you are controlling the situation. By rewarding him yourself, you are teaching him that compliance and listening to you; is actually rewarding to him. And, it is really simple to do! Previous Post Lyme Disease; Know the Signs and PreventionNext Post How is Your Relationship? I am having trouble teaching my 12 week old sheperd to stop barking any assistance in how to train in this area. In one of Chet’s news letters, not too long ago, he addressed this exact problem. If you can go back to this news letter you will find some very good advice.I don’t remember exactly when but it was in the last month or so. Hi Gary, I think you can also see it in the introduction video titled “Look What Any 11 Week Old Puppy Can Learn To Do!” This has completely changed my own response to Frankie’s barking behavior and it worked instantly! I couldn’t wait to try it after I saw it in the video. I just turned my back on Frankie when he was barking for no reason at the front door. I just calmly stood up, turned my back and backed up a little towards him. I am not exagerating he instantly stopped barking! I didn’t get mad or shout over his loud barking. In addition, responding calmly has improved my relationship with him too. I don’t get upset over his untrained /incorrectly trained behavior any more. Instead I see it as proof that we need more work together and I am doing my best to put the time in with him. Look at that video again. Best wishes, Lilly and Frankie-an older dog learning new tricks! I also have a problem with my dog Patches. He does all his training very well with “Go to the Mat”, “Sit & Stay & Leave it” etc.., however after his training he is so excited and starts barking and jumping around even though I turn my back to him and ignore his antics. But then he jumps on me and then I have to put him in a time out for 5 minutes then he is calmed down. I don’t like to do that but sometimes he is incorrigible. When I train him he is very attentive and he is smart. Can you help with this problem? It would really make me feel comfortable with him if I didn’t have this issue with him. All the Best Sharron and Patches 9 months old learning great behaviors! IM ALSO TRYING TO GET MY 7MTHOLD DOG TO STOP BARKING AT NIGHT WHAT SHOULD I DO? Very well written and very informative. Taking control of every situation, coupled with daily obedience training is the only way to maintain a high level of confidence. I train my dogs to sit, there are many things your dog can’t do when he is sitting. Will this work if my dog is simply very aggressive towards strangers and other dogs? He gets along just fine with me, my friends, my family, and his ‘wife’ but aggressively goes after every other person and dog when we go outside, no matter what age or size. What do I do now to reward him while training? You can freeze or bake his own treats using the same prescription diet but in the canned form! Not all dogs can get along together! It has nothing to do with you, it is just dog behavior. You may have to do shifts of the ones who don’t like each other in crates or outside and then switch or rehome them. People love Frenchies they could live happy lives separate! MY 11 WEEK OLD CORGI BITES RELENTLISLY TO PLAY AND IM NOT SURE IF SHE IS TEETHING OR JUST CANT CONTROL HER TEETH AND HAS TO BITE ??????????? She is a baby, she needs lots of toys to choose from, lots of exercise, and you need to give her something appropriate to bite when she is biting you…or leave the room! I usually make sure and take my dog out every half hour or so just to make sure he does what he needs to do, then reward him after he comes in, even if he does nothing outside, eventually he will get the message to just go outside.I have a lab puppy that is only 7 wks. old and he goes on command,but still take him out every so often just to make sure if he has to go or not, and always remember to give him a treat if he does anything out there or not….trust me he will get the message , and make sure you go out with him to see that he does his duties.that is how you will know whether he had to go or not…. THANK YOU FOR THE IMFO. I NEEDED THAT TO HELP ME WITH MY DOBERMAN. My mini-dachshund is 2 1/2 years old. He is not neutered. I got him when he was 8 months old from people who’d bought him from a breeder at 2 months old. In the last 5 weeks, he has begun to try & bite people’s calves or knees. This has happened when I am sitting with him usually in public, but just a few days ago when we were sitting in the yard when he actually nipped someone. Prior to this, he’d begun trying to do this when we were walking on the street. When I first got him, he was very timid & scared of everything. I think he is still scared but has become territorial & defensive. In all cases he has been on a leash & I’ve pulled him back & sharply & told him “No” but that does not always stop his aggressive barking & struggling to resume his attack on the person. He will do this with kids especially if they are nervous around him. First neuter. He does not need extra hormones that make him more territorial and possessive!! Get it done asap. How do I potty train a 15 month old Maltese. how do i train a security dog? Today we were at the dog park and other dogs come by and was smelling her and almost bit her. Of course I had to hold a bull horn for me to scarre away other dogs. She is so sweet around me but around other dogs she is agresive. Any suggestions? Please leave something! If she doesn’t like other dogs, the dog park must be torture! If you want to socialize her take a class, but don’t force her to socialize in a dog park! I would stop taking her to the dog park. If she is aggressive toward other dogs, the dog park must be torture and extremely confusing and she must feel out of control. If you want to socialize her take her to a class where everyone has to maintain certain behaviors and is safe! My husband and I adopted a Boxer/Pit mix. He is a great dog for the most part well behaved. The main problem is he plays to rough. If we play tugawar when he goes to rebite to get a better grip he sometimes gets your hand or when we play fetch he brings the toy back but runs into or jumps on you. How do I stop this behavior? Turn the game of tug around. The tug is the reward, the cue is whatever you want I use “freeze”, and the behavior is 1.release your mouth, 2. sit and 3. behave calmly. Start with the posture you want and with the dog calm. Begin rewarding that with a high value food treat. Take a step away, turn and offer a play posture, let the dog just begin to feel some excitement, stop your play-posture and stand straight up (giving an additional visual cue) hand signal for a sit, when you see the dog begin to fold into a sit, cue “freeze” and provide another high value food treat. When she seems to be getting it begin to use the tug toy as the reward instead of the food. Now, when you say “freeze” you, continue to hold the tug toy but stop playing, wait for the dog to sit or hand cue the sit, wait for the dog to relax, while you hold the tug toy out of sight. When you are satisfied that the dog is calm, re-offer the tug toy and resume the game, for a couple of seconds! Again stop playing, cue “freeze”, wait for the sit/calm then tell your dog how smart she is give her one more tug for a second or two stop play cue “freeze” wait for the sit/calm and tell her how smart she is and how much you love her and do it again tomorrow. My 2 year old German Sheppard barks at everyone when outside. He acts aggressive to all strangers. He will bark and run back and forth through the house if a truck or motorcycle passes. What can be done to help him with this problem. He has been throgh 4 different trainig classes and is fine at class. He is fine with all friends and family, even small children if they just come into the house. forget that you are 12 years older since you had a puppy. I don’t know what to do either. He is ok with people who come into the house, but barks like a maniac before then. He is also ok with trainers. i have a aprox three year old labrottie mix most peole think he is a over sized pit bull and he acks like one most times. i requesd him last january 2012. he is very big al ready i expect he is going to get bigger at present he is 70 lbs i had him up too 80 at one time but after biting a person he was put in dog jail for ten days he lost weight. after some time he has now become even more aggressive with outsiders. in my home he obeyss all his comands very well. he is by my side 24 /7 i am disabled he will not leave my side most of the time. now we go out side in our yar he does ok but heaven for bid ome one stops to talk to me he becomes one nasty feller. i have him on a leash at all times even in my yard as we need ecersise i too am on a 30 min per day regement as much as i can stand i been confinded to a wheel chair a long time an learning how to walk again while on hi sleash i correct his behavior as not to lung at people he i now decided he ome after me he has never bit me but close it has become a tug of war on the leash he will sit when i ask him too but then bam he lunges trying to bite my guest although there be a fence betweeeen my guest and us he thinks he has to protect this moring he decided even kids are a target this is not good. there is no reson for it. i cn cll his name an i get eye contact i can call to him HERE and i get the orrect respons he is rewarded only if we are alone. i do not want to reward him after a correction with people there as he has at a time decidd it is a game if he dose bad action then does good action it is treat time. he has become a red zone dog even with me at times. can you help i have him and i in dog training clss he is good there but at home it all bck to give me my treat no matter what. You need a veterinary behaviorist to come to you and put you and him on a behavior modification program and possibly drug therapy. 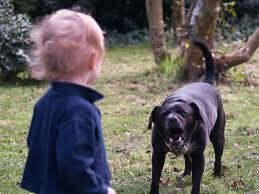 Only a behaviorist can see your limitations and your dog’s aggression. I cannot give advice because I cannot see either of you. I have two small dogs; the older one a yorkie(5 years) is a rescue dog. He is very loving, and was good. I now have a cross yorkie-bechon, now 1 year old. The younger dog cannot understand that he should go outside to pooh. He will only wee in the garden. He barks when I fuss the yorkie, and will not stop. He wants my attention all the time. The yorkie is very jealous when my friend brings her dog. He gaurds the younger dog, and will not let him play with my friends dog, and jumps on the younger dogs back, they have both been nuetured. Any one any ideas what I do. It is driving me to distraction. I Live in Nicaragua, and I have adopted a dog about 10 months old…She is really sweet, but she is very agressive when Men come around. I have to tie her up because she barks and barks ,and she will go after them wanting to bite..When we are away from the house she loves everyone, I would like to train her that when I say it is Okay she stops. Is it possible to do that? I noticed sometimes she is wagging her tail when she barks and acting aggressive. A man friend was here the other day and she was sniffing his hand then he went to pet her and she snapped at him..so far she has not bitten anyone but I’m casreful to make sure she is on a lead…We have a fenced yard, and we do want to keep people out..All know we have the dog..Here in Nicaragua it is best to keep your property protected..
Use a leash and stop allowing her to get that close. She is obviously uncomfortable with other dogs, so don’t let her socialize until and if she is comfortable. Don’t focus on the other dogs, focus on getting her to give you attention instead of barking and growling and carrying on. Get her to give you eye contact. This will defuse the situation and give her confidence that she doesn’t HAVE to socialize! she is responding by showing the best defense is a good offense, instead make her comfortable and let her know she doesn’t need to socialize and that you prefer she not. Once you have her total concentration you can then decide. But you are right if she snaps at the wrong dog…it could kill her. I would keep her out of this situation completely. My Puppy Honey Is 10 Weeks old and she bites when over excited or when i do my chores like sweeping or when people walk will dhe grow out of it! Im 11 By the Way! she needs regular exercise and play and lots of toys to play with. I have a very friendly 2-year old shih tzu named Cali. She would never bite anyone, but she barks ferociously at dogs, people walking by our house, people on bikes, and golf carts when she can not get near them because she is on a leash or inside the house looking out. When we take her for a golf cart ride, again she barks ferociously at dogs, people, golf carts, and bikes. If we stop and let her out of the golf cart near where the dogs or people are, she is very friendly and sniffs the dogs and jumps up at the people – unless they leave because they are afraid of her, although she has stopped the barking. How can we get her to stop this? You will have to back up in your dog training and get to to ignore other stimulation and give you attention instead of barking and growling etc. And, be very careful, as of yet you are lucky that she has been friendly, but barking and growling and her behaviors are a precursor and a warning that more aggression and biting may be next. I could really use some help. I have a rescue puppy,he has his potty issues sHe refuses to go out sde. I have spent hours outside with him only to have him come in and do his business. Wetry to keep good eye on him but he does it so fast! He has chosen three favorite poop sites, I put down paper.HA! He tears them up. I’ve carried him outsde in the middle of his pooping anhe stops going until I let him back in. Then it starts all over again. Any helpful tip will help me. Read this and don’t allow her access to the house unless she is with you. Hey, I have a dog who is about 17-18 wks. old and she only listens to my sister. When she was about 5-10 wks. we had a great relationship but now we don’t. The other day i accidently squished her in a door, she was very scared and was squeakin when i picked her up, she forgave and cuddled. Now our relationship is way much better but not as much when she was 5-10 wks. I just want a way for her to ONLY listen to me and LUV me only! I was thinkin about givin her away next week if she doesn’t start to listen. I really am not lookin forward to letting her go! please help me. Well, I am kind of torn here. Part of me recommends that if this is all it takes for you to want to find her a new home you should let her go earlier rather than later since this is not at all her fault. A dog should listen to and love as many people as possible. You cannot force a dog or any animal to love you more or less than someone or something else. All you can do is spend time loving and training them and hope that it is reciprocated. But the dog may very well love someone else and listen to someone else also. If she is barking and not pottying anyway, I would take her somewhere else. Find somewhere more secluded even if you have to drive a minute or two to a secluded spot (and then of course clean it up). Work on getting her focus and eye contact and then add distractions from a distance or get her into a class where she will have to learn to obey in a distracted environment. I have a 3 year old spayed female boxer/lab that i have had simce she was 1 she has had over 300 dollars in training and is the best dog i have ever had and we believe she was abused by men before we got her. When she is in public or even at home she is great around women but when a man comes around she cowars and hides behind me and does this really low bark thing thats not really a bark and she shows no kind of agression at all i have spoken to trainers and i dont know how to help her it even tool her a while to get used to my husband what can i do can you help me? Get men that you know and trust to toss her great treats, like chicken breast or steak. Toss them with no expectation of touching her, talking to her or even looking at her. If she is not barking or hiding have them toss treats to her feet. As she gets better you can have them look at her, or talk to her…but let her adjust slowly. She may never want men she doesnt know to pet her, so don’t force her! I would be very careful at trials! There are a lot of people who have conformation dogs (especially) that have no dog manners and people are running from one place to another with dogs not paying attention to who is where and who’s dog is running over another. A lot of these people have lots of money and their dogs are very expensive and if your dog starts a fight with one of these dogs you could be looking at serious liability issues. Instead, I would take class after class of obedience,or rally, or advanced obedience and agility so that it is a more controlled environment. 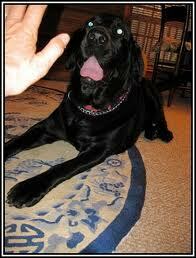 This will give your dog a feeling that he is in more control and less likely to get grabbed or run over. Once he is showing little to no signs of fear or aggression and you have built his confidence you can bring him back to the trial world and compete again. This may take time, many months or even a year or more. But it is better to have a confident dog that competes successfully with no fear or aggression than one that is a loaded gun just waiting to go off and injure someone or something. I rescued a Schnauzer cross about 10 months ago, he is about 20 months old now. He is very loving with my husband and me but when someone comes into our home he shies away then tries to bite their ankles when they walk past him. I always put him on a leash when someone is here and make him sit quietly by my side, which he does. But when I walk them to the door he will still try to attack as they turn to leave. When we are on a walk, he used to tug at the leash, growl, and try to aggressively approach anyone he could see. Since I read this article, I have been having him sit by my side until the other person passes us then we continue our walk. That has made a huge difference, and now he usually will just keep walking with me without a fuss. We still have a problem if the other person is walking a dog, he will pull, growl, and get in a frenzy and I have a difficult time even getting him to sit. Do you think if I keep having him sit by my side he will eventually learn not to be aggressive toward other dogs or is there something else I should be doing? I am planning on taking him to obedience classes this Fall. I have purchased a muzzle for him so I won’t have to worry about him biting but I don’t know if that is the answer. Any advice? Thank you for writing this blog. I and my dog have learned a lot from the Dog Training Secret and your wise advice. I would get and use a gentle leader for him so you can control his head. He could still bite, but this will give you more control of the area in question. If you know he is going to leap at their legs as they leave you can use the gentle leader and gently pin his little face and leash down to the ground with your foot as they leave. Then if he tries to race upward to bite or give chase he will be stuck. Also I would not let him “look” at the things that are bothering him as you pass. This staring at the “jogger” or whomever can build frustration and more aggression. Instead use the gentle leader to turn his body to the distraction and have him stare at YOU. Use treats and praise and once they have passed he can be released and you can continue walking but looking at something is a reward and he is not earning that. As he gets less and less aggressive he can look at things as long as his body is not tense and he isn’t growling etc. but the minute he stares or his body gets tense require him to turn from the object and give you his attention! 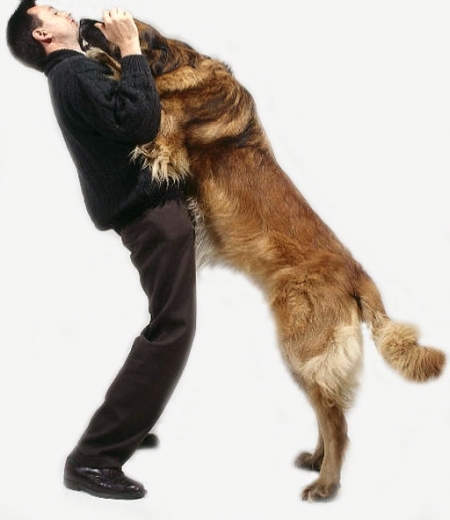 http://www.thedogtrainingsecret.com/blog/utilize-gentle-leader-similar-head-halters-dog-training/ Read this. He will hate this…but you will learn to love it!